Great Wild Elk is a feature-rich, 10-payline online slot by NextGen Gaming. The base game reels are enhanced with a random Elk's Light Feature that ensures the outcome of an ongoing spin will result to one or more payline wins. The Free–Spins Bonus Round on the other hand, optimizes bonus spins with a continuously increasing add-on bonus reward called Enduring Win. The images of a Great White Elk and of a Mythical Tree represent more than just Wild and Scatter Symbols. Their emergence after a spin brings guaranteed wins, as both are programmed to trigger a related pay-boosting feature. Occasionally and during an ongoing spin, a glowing white light fills the slot screen to reveal at random, one of the top-paying reel icons. The images include two (2) beautiful Forest Spirits, an Eagle, a Squirrel and a Snake. Once the spinning motion comes to a stop, the featured Elk's Light symbol will replace one or more Red, Blue, Purple, or Green Rune Symbols appearing as outcomes of the spin. Since the Elk's Light will add more than one identical symbol to the reels, the outcome of the spin that triggered the icon-substitution feature will likely contain one or more payline wins. A full-reel image of a White Elk takes center stage as the Wild and Bonus Game Trigger Symbols. Appearing only in Reel 3 after any spin, the emergence of the huge White Elk Wild initiates the launch of the Enduring Win Free-Spins Round. During the free games, Reel 3 will hold the Wild Elk Wild Symbol in position through the end of the free round. Technically, therefore, three (3) Wild icons are constantly and readily available as alternative symbols that may complete identical symbols positioned in the first and second reels. Take notice of the gigantic tree trunk glowing in the backdrop. The image is replicated as the Tree Symbol. It appears only in Reels 1, 2, 4 and/or 5, and in the event that a spin produces four (4) Tree Scatter Symbols in each of the designated reels, 500 coin credits multiplied by the Total Bet will be awarded as Scatter Win. 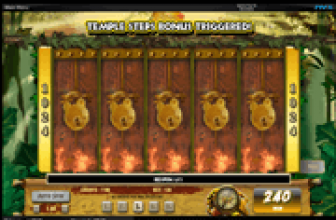 In the Enduring Win Free Games, the appearance of the Tree Symbol in any of the four (4) reels triggers the release of the special Enduring Win bonus prize. The number of free games ranges from 4 up to 10 bet-free spins, but is determined at random. During the round, a bonus reward called Enduring Win will be added to a player's winnings. 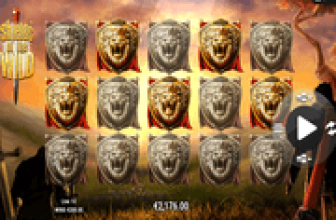 The win-amount produced by the Elk Wild when it triggered the bonus round will be loaded as the initial Enduring Win reward. “The Enduring Win” prize money comprises all rewards won from the outcome of bonus spins. This denotes that if the succeeding free-spins produce more winning payline combos, the Enduring Win amount will continue to grow. The running total can be gleaned via the Enduring Win box located at the top of the slot screen. If after a bonus spin, the reels return with at least one Tree Symbol in any of the four designated reels, the current Enduring Win pooled amount will be released. The amount will be awarded as payout for the Tree Symbol and in addition to the winning payline payouts. In the event that more than one Tree Symbol triggers the release of the Enduring Win bonus prize, two or more Enduring Win prizes, one for each Tree Symbol will be awarded. A Tree Symbol occurring as outcome of the final bonus spin will trigger a re-spin. During a re-spin bout and after the free games, only the Tree Symbol may emerge as outcomes. This denotes a succession of re-spins will award only Enduring Wins and re-spins as bonus rewards, for as long as Tree Symbol/s re-appear. Great Wild Elk - Incredible Enduring Win Feature Brings Extra Bonus Pays and Re-spins! Great Wild Elk online slot is as rare as its namesake, as games developer NextGen Gaming configured the Free-Spins Games with an Enduring Win feature. This bonus game element furnishes extra bonus rewards that increase the payline winnings gained from a specific outcome of a bonus spin.